Charles Donovan, the eldest of nine children of Charles Donovan, was born in Calcutta (now Kolkata) in Bengal (now West Bengal) on 19th September 1863. He was from an Irish family and his father, a judge, worked for the Indian Civil Service. Charles was educated in Dehra Dun and Mussoorie until he was 13. In 1879, he was sent to Cork City in Ireland to live with his grandfather, Rev Charles Donovan. He continued his education there and studied at Queen’s College in Cork. He then studied medicine at Trinity College in Dublin and received his MD degree in 1889 from the Royal University of Ireland. Donovan married Mary Wren in Bombay in 1891. Mary was his cousin and the daughter of Rd. Henry Donovan. They had two daughters, Helen and Amy, and a son Reagh. While Donovan was posted in Mangalore, he was delirious with malaria and later contracted cholera. As there was no medical help available nearby, he asked his wife to keep pouring whisky down his throat until his condition improved. This appeared to work and he recovered! After retirement from the Indian Medical Service in 1919 he returned to UK to settle in a small village called Bourton-on-the-Water in Gloucester. His wife died in 1940, and he lived with his two daughters while his son studied engineering at Cambridge University. He died on 29th October 1957 at a Cottage Hospital in Bourton. All his children died in their early adulthood without leaving any children of their own. After post-graduate training in Dublin, in 1891, Charles Donovan was commissioned as a captain in the Indian Medical Service. After receiving his probationary training at the Royal Army Medical Corps in Nutley, Hampshire, he set sail for India on 30 September 1891 reaching Bombay (now Mumbai) on 26 October. Over the next seven years, he served in Mandalay (Burma now Myanmar), Madras (now Chennai), the north west frontier region of Afghanistan and in Mangalore on the west coast of India. In 1898 he was posted to Madras. He served briefly at the Surgeon General’s Office before being appointed as Second Physician at the Madras Medical College and Government General Hospital. He also served as Professor of Physiology at the College. In 1910 he was transferred to the Government Royapettah Hospital, Madras, to become its first Medical Superintendent. He rose to the rank of Lieutenant-Colonel and continued to teach until his retirement in 1919. Donovan was a pioneer in tropical illness and a keen scientist. His research on visceral leishmanis and granuloma inguinale is significant in the understanding, diagnosis and treatment of these serious conditions. He also investigated malaria in the monkey population in the Nilgiris (Blue Mountain) hills near Madras. In 1900, William Boog Leishman first discovered the protozoan parasite in an English soldier who was stationed in West Bengal and died at the Army Medical School in England. But he mistook the parasite to be degenerate trypanosomes, a known protozoan parasite in Africa and South America. In 1903, Leishman published his discovery titled, “On the possibility of the occurrence of trypanosomiasis in India” in the British Medical Journal (BMJ). On 17th June, 1903 Donovan found the parasites (now known as Leishman bodies) in the spleen tissue and blood of an infected young boy who was admitted to Government General Hospital. At that time these were identified as quinine resistant malaria. Donovan identified them as the causative agents of Kala-Azar. He wrote a commentary of his discovery in relation to that of Leishman with the same title which appeared in the BMJ on 11 July 1903. Granuloma inguinale is a chronic bacterial infection that frequently is associated with other sexually transmitted diseases. Granuloma inguinale is characterized by intracellular inclusions in macrophages referred to as Donovan bodies. Granuloma inguinale usually affects the skin and mucous membranes in the genital region, where it results in nodular lesions that evolve into ulcers. The ulcers progressively expand and are locally destructive. Charles Donovan discovered the causative organism for this condition – the intracellular bodies later named as Donovan bodies - from the tissue smears prepared from the ulcerative mouth of a ward boy in the Government General Hospital. Donovan’s student, Professor Rajam, published the WHO monograph on the re-named Donovanosis, as he believed this name was more appropriate than the more confusing term of Granuloma Inguinale. Donovan was a dedicated doctor and inspirational leader. He spent a significant time each day in the medical ward with patients and students. He worked hard, holding ward rounds in the evenings and on Sundays. He realized the importance of good diet and nutrition for his patients, and considered this far more valuable than the medicines of his time. Donovan is said to have possessed a dynamic and original personality, and was an excellent clinical teacher and microscopist. He encouraged research throughout the hospital, insisting that his students and colleagues develop their skills with the microscope. He shared his scientific literature and journals. Dr Sir A L Mudaliar, who was a famous gynaecologiest and served as the Vice Chancellor of the University of Madras for many years was one of his notable students. Prof R V Rajam (Venereology) was also one of his students. He created the Madras Medical College Athletic Association by funding it himself and invited all the staff to join. Charles Donovan had a keen interest in natural history and particularly in butterflies and birds. After retirement, he produced a catalogue of the Macrolepidoptera of Ireland. In his diary, days before his death, he made his last notes on butterflies. Some of his collections are still preserved in the Natural History Museum, London. · Klebsiella granulomatis infection is most popularly known as "donovanosis" in medical community. 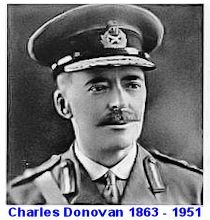 · Charles Donovan was awarded the Tirah Medal of the Indian Medical Service in 1897 for his service in Afghanistan. · His portrait was unveiled by the Governor of Madras in 1953 at the Madras Medical College. · University College Cork in Ireland instituted the Charles Donovan Prize for Dermatology.